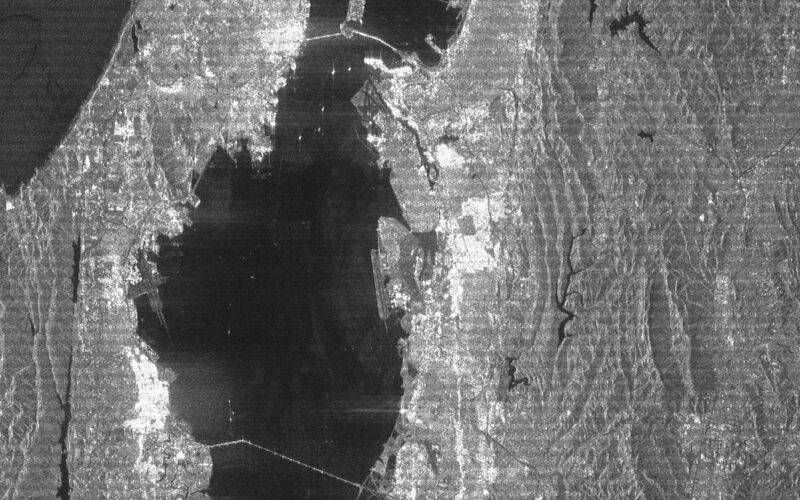 The San Francisco Bay Area in California and its surroundings are shown in this radar image from the Shuttle Radar Topography Mission (SRTM). 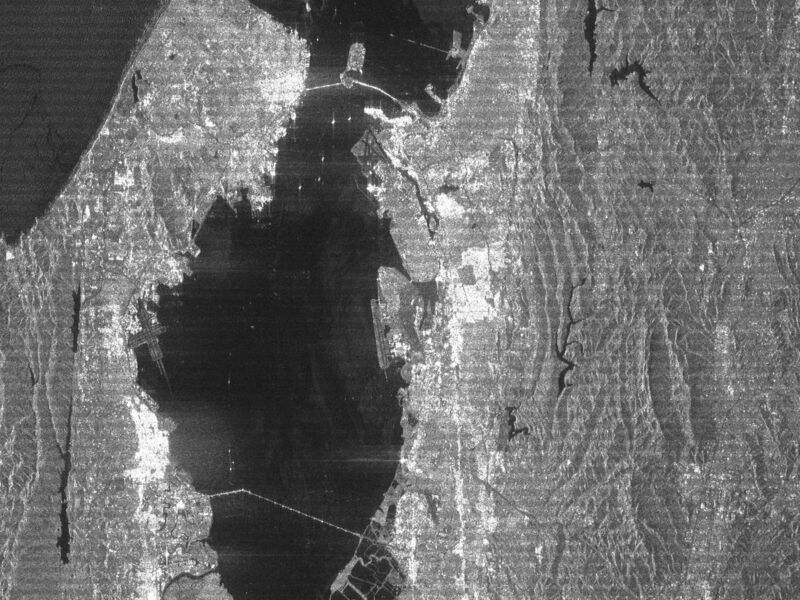 On this image, smooth areas, such as the bay, lakes, roads and airport runways appear dark, while areas with buildings and trees appear bright. Downtown San Francisco is at the center and the city of Oakland is at the right across the San Francisco Bay. Some city areas, such as the South of Market district in San Francisco, appear bright due to the alignment of streets and buildings with respect to the incoming radar beam. Three of the bridges spanning the Bay are seen in this image. The Bay Bridge is in the center and extends from the city of San Francisco to Yerba Buena and Treasure Islands, and from there to Oakland. The Golden Gate Bridge is to the left and extends from San Francisco to Sausalito. The Richmond-San Rafael Bridge is in the upper right and extends from San Rafael to Richmond. Angel Island is the large island east of the Golden Gate Bridge, and lies north of the much smaller Alcatraz Island. 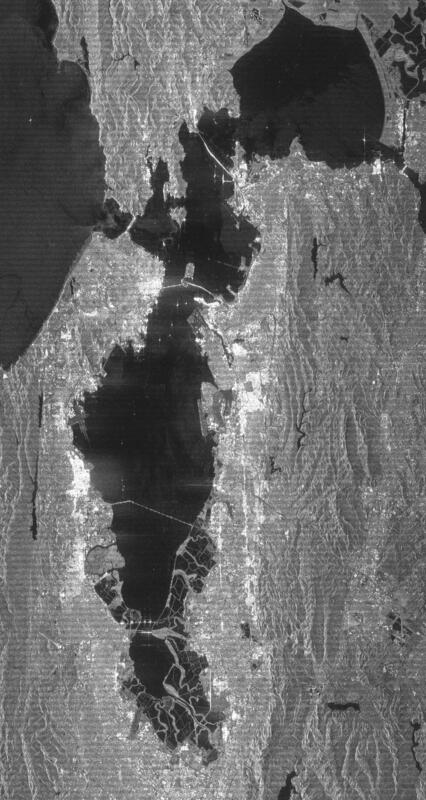 The Alameda Naval Air Station is seen just below the Bay Bridge at the center of the image. Two major faults bounding the San Francisco-Oakland urban areas are visible on this image. The San Andreas fault, on the San Francisco peninsula, is seen on the left side of the image. The fault trace is the straight feature filled with linear reservoirs, which appear dark. The Hayward fault is the straight feature on the right side of the image between the urban areas and the hillier terrain to the east. This radar image was acquired by just one of SRTM's two antennas and, consequently, does not show topographic data, but only the strength of the radar signal reflected from the ground. This signal, known as radar backscatter, provides insight into the nature of the surface, including its roughness, vegetation cover and urbanization. The overall faint striping pattern in the images is a data processing artifact due to the preliminary nature of this image product. These artifacts will be removed after further data processing. This image was acquired by the Shuttle Radar Topography Mission (SRTM) aboard the Space Shuttle Endeavour, launched on February 11, 2000. SRTM uses the same radar instrument that comprised the Spaceborne Imaging Radar-C/X-Band Synthetic Aperture Radar (SIR-C/X-SAR) that flew twice on the Space Shuttle Endeavour in 1994. The mission is designed to collect three-dimensional measurements of the Earth's surface. To collect the 3-D data, engineers added a 60-meter-long (200-foot) mast, installed additional C-band and X-band antennas, and improved tracking and navigation devices. The mission is a cooperative project between the National Aeronautics and Space Administration (NASA), the National Imagery and Mapping Agency (NIMA) of the U.S. Department of Defense (DoD), and the German and Italian Space agencies. It is managed by NASA's Jet Propulsion Laboratory, Pasadena, CA, for NASA's Earth Science Enterprise, Washington, DC. Location: 37.7 deg. North lat., 122.2 deg. West lon.